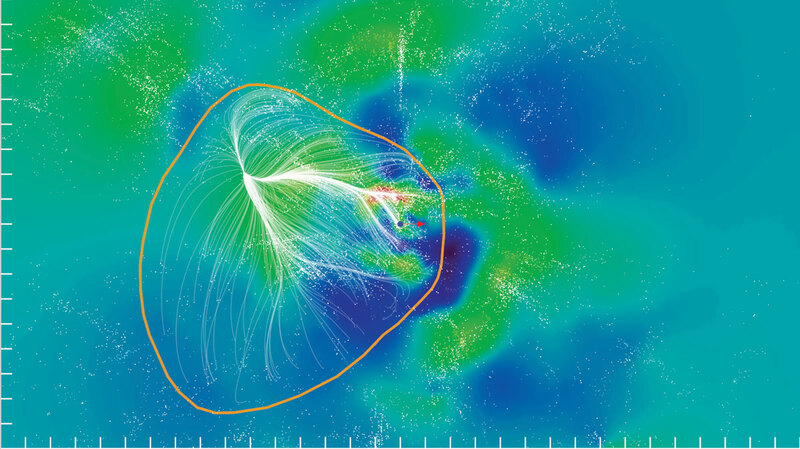 After many years of cosmic map making, Brent Tully and his colleagues have (re)defined our local supercluster of galaxies and given it a new name: Laniakea (from the Hawaiian: “lani” is heaven, and “akea” is spacious or immeasurable). Rather than simply plotting positions of galaxies near to us, Tully and his team took into account the radial velocities of the galaxies, which in turn allowed them to derive the peculiar velocities (which is the “true” velocity of the galaxies in local rest frame, which in this case is the difference between the radial velocity and the velocity expected purely from the general expansion of the universe). These peculiar velocities are driven by gravitational effects, and are better tracers of total mass (for all types of matter, both luminous and dark) than simple positions of individual galaxies, which primarily show the location of baryonic matter. By mapping the peculiar velocities of many galaxies in our region of the Universe, information on galaxy motions and large-scale flows can be derived and a more accurate definition of the shape and extent of our local supercluster can be derived. Laniakea is larger than the historical local supercluster defined up until now. Our Milky Way galaxy is at the origin. Regions with well known names like the Great Attractor, Pavo-Indus, the Antlia wall, Fornax-Eridanus cloud, as well as the clusters Norma, Hydra, Centaurus, Virgo, Ophiuchus, Abell 2870, Abell 3581 and Abell 3656 are all embedded within the new Laniakea supercluster. Shapley, Hercules, Coma and Perseus–Pisces are complexes of galaxies outside Laniakea. The supercluster region includes 13 Abell clusters, including the well known Virgo cluster. Local velocity flows within the region converge towards the Norma and Centaurus clusters, in good approximation to the location of what has been called the ‘Great Attractor’, after survey work done in the 1980s and 1990s. This volume includes the historical Local and Southern superclusters, the important Pavo-Indus filament, an extension to the Ophiuchus cluster, the Local Void, and the Sculptor and other bounding voids. This region of inflow towards a local basin of attraction can be reasonably called a supercluster. If we approximate the supercluster as round, it has a diameter of 12,000 km/s (recession velocity) or a distance of 160 megaparsecs, and encompasses ~1017 solar masses. The present work uses a new catalogue of galaxy distances and peculiar velocities, that extends to recession velocities of 30,000 km/s (redshift z = 0.1) and with 8,161 galaxy entries. The new catalogue is called Cosmicflows-2 and the six main methodologies for the distance estimates rely on the characteristics of Cepheid star pulsations, the luminosity cut-off of stars at the tip of the red giant branch, surface brightness fluctuations of stars in elliptical galaxies, the standard candle nature of supernovae type Ia, the adherence of elliptical galaxies to a fundamental plane in luminosity, radius, and velocity dispersion, and the correlation between the luminosities of spirals and their rates of rotation. Suspicions of higher order galaxy clustering (i.e. cluster-cluster rather than just galaxy-galaxy clustering) had been aired from as early as the 18th century. Nearby overdensities had been noted in the work of Messier and the Herschels and obvious overdensities were clearly seen in associated figures of the Shapley-Ames catalog (Shapley and Ames 1932). Shapley and Ames refer to a notable overdensity as the “elongated Virgo supersystem”. The Local Supercluster revealed itself as nearby clusters tended to favor the northern Galactic hemisphere with the Virgo cluster dominant (de Vaucouleurs 1953) although de Vaucouleurs at the time used the term ‘supergalaxy’. The authors of the recent Laniakea work stress that in the fullness of distance measurements on a much larger scale it will almost certainly be demonstrated that Laniakea is not at rest with respect to the cosmic expansion and is only a part of something very large that is at rest in the cosmic reference frame.